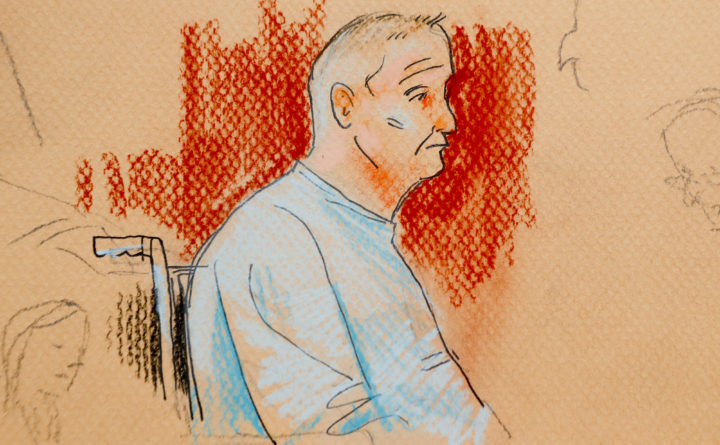 This courtroom sketch depicts Robert Gregory Bowers, who was wounded in a gun battle with police as he appeared in a wheelchair at federal court on Monday, Oct. 29, 2018, in Pittsburgh. Bowers, accused in the Pittsburgh synagogue massacre, appeared briefly in federal court in a wheelchair and handcuffs to face charges he killed 11 people. If foreign citizens had mailed pipe bombs to prominent Democrats, or massacred Jews in a synagogue, there’s a good chance they would have been charged with terrorism. But that won’t happen with either of the men charged in the recent wave of mail bombs and the Pittsburgh shootings. That’s because there’s no domestic terrorism law. Bowers also faces number of state charges filed over the weekend, including 11 counts of criminal homicide. Allegheny County District Attorney Stephen Zappala said Tuesday his office sought to have Bowers arraigned on the state charges but were denied by federal authorities. Zappala said that he would prefer that local residents “sit in judgment” of Bowers in a trial, but instead would let the federal case proceed and put the state charges on hold for the time being.